With this handy kit, two flavors of bubble tea are within reach at your leisure. Boba; bubbles; tapioca pearls—all terms for the chewy treats that slide up the rotund straws traditionally used to sip Taiwanese bubble tea. Intrigued? Now, thanks to Katie and Dustin Watts's make-it-yourself kit, you can whip up a hot or cold batch of your own. 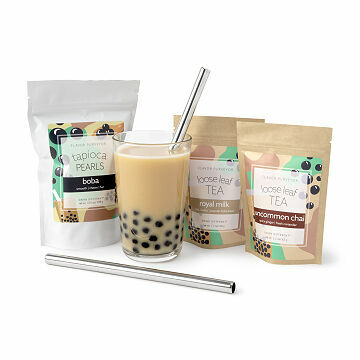 With two flavors of tea—classic black and rooibos chai—tapioca pearls, and two reusable stainless steel straws, this addictive delight is now home-brewable. Just add your choice of milk (or not!) and enjoy. Hand-assembled in Georgia. Stainless steel straws are dishwasher safe. I will be buying this on a bi monthly basis. Disappointed there weren't any straws! I was so excited to give this as a gift to my husband because he LOVES bubble tea. When I opened the package to take a peak before giving it to him, I noticed that the straws weren't included. I was pretty bummed that the whole gift wasn't there to give him. Hopefully, he'll like the tea regardless. However, since this isn't the first time I've have difficulties with orders from Uncommon Goods, it'll probably be my last order with the company. It's possible to put together a similar set of items for less. However as a gift for friends who live out-of-State, this is a fun kit with most everything they would need to make Bubble Teas at home. Tastes great, but more time consuming that I thought it would be. I couldn't get the boba really soft, too chewy. Bubble Tea is the Best Gift for a Teen! Every teen knows the local jaunts to buy bubble tea in their world, but the gift of bubble tea making at home is the best! Both daughters loved this gift. My cousin and his kids loved it! It was so delicious, we needed to reorder after one week! It was a great set, everything needed was provide. I love the reusable steel straws! The tapioca is good quality and chewy and delicious. A bit pricey but good for an intro to making your own bubble tea, all in one kit. I love making this Boba tea on Saturdays and having as a dessertl treat all weekend long. We were excited about the arrival of the gift even though we knew it would arrive after Christmas. However my daughter was disappointed with the tea flavoring and the dryness of the boba even after soaking it.